Killer Noodle in WLA Sawtelle Japantown is pleased to announce a Grand Opening special event on Sunday, October 15, 2017 in Sawtelle, Los Angeles, followed by the official Grand Opening of the restaurant on the 16th. (LOS ANGELES, Calif.) -- NEWS: Killer Noodle in WLA Sawtelle Japantown is pleased to announce a Grand Opening special event on Sunday, October 15th in Sawtelle, Los Angeles, followed by the official Grand Opening of the restaurant on the 16th. First 300 customers to arrive at the event will have the opportunity to receive a FREE Tantanmen. In order to get the special offer, customers only need to "Like" Killer Noodle on Facebook or "Follow" KillerNoodle_tsujita on Instagram. Stimulating spiciness with robust sesame flavor and umami. This is for those true lovers of the hot and spicy! Features sharp spiciness of cayenne pepper and numbly prickly powder. Combination of raw cayenne pepper and black pepper to bring out the rich spice, topped with a squeeze of lemon. When ordering your Tantanmen, please first select your flavor option from above, then choose from "ramen soup style" or "without soup stir fry style" for the cooking method, and finally, let us know how spicy you would like for your noodles. We also have various toppings available for you to add on to maximize your killer Tantanmen experience! 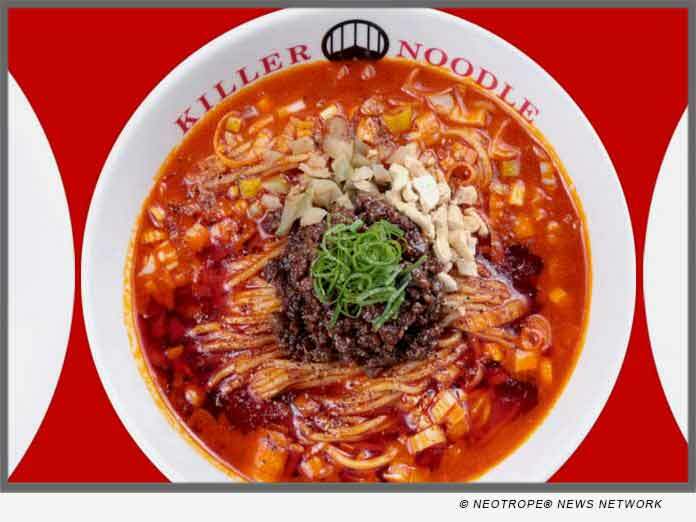 To learn more about Killer Noodle and our upcoming events, please visit: http://www.killernoodle.com/. Address: 2030 Sawtelle Blvd., Los Angeles, CA 90025. Grand Opening Date: October 16, 2017. Hours: 11 a.m. - 3 p.m., 5 p.m. - 11 p.m. (last call 10:30 p.m.), Closed on Wednesdays. Tsujita, California's most renowned Tsukemen and Ramen house group, is ready to surprise American customers with its new location specializing in Tantanmen, Killer Noodle Tsujita, which will soon open in Sawtelle, West Los Angeles. *Photo by Ocean Photo Studio / WANANN, Inc.